With promises of a season finale that would solely focus on the three original characters, a much quieter ending, and only an hour to tie up any loose endings, Grey’s Anatomy wrapped up its seventh season in its classic, emotionally-charged fashion. Although there was neither an unforgettable ferryboat accident nor a haunting shooting this year, "Unaccompanied Minor" held its own when a 757 crashed and required our SGMWH surgeons’ attention more than ever. Furthermore, this remarkable season finale will go down as another to remember as the stakes were high and the emotional toll was unbelievably heavy. I can honestly say that I was shocked by the 757 crash storyline. I never expected to hear that nearly every passenger wouldn’t even make it to the hospital. The scene in which the families reacted to the bad news of losing their loved ones was heartbreaking. As my tissue box sat inches away, I realized that I hadn’t needed it for Grey’s Anatomy in quite some time. Thankfully, the tissues with aloe still do just the trick. It was such a moving and touching moment when the families stuck around to be there for the unaccompanied minor. Regardless of their circumstances, these strangers came together to be there for a young girl and her mother. That’s really saying something. I loved the scene when MerDer were planning out where the baby room and crib should be. Although I am frustrated by the way things ended for MerDer on this episode, I get why Derek needed some time on his own. Whether or not Meredith was helping Adele and Richard, she was dishonest and the Alzheimer’s trial was extremely important to him. Something tells me that Derek will be back with his McFamily at the start of next season. Besides, how could he resist baby Zola? Also, how great is Meredith with Zola already? Although Meredith kicked Alex out, I almost wished he had stayed. He would have been great helping Meredith with Zola. There was much more baby discussion when Cristina found out that she was pregnant. Like Owen, I know precisely who Cristina is and how important her career is to her. However, Owen was right in saying that she needed to at least consider what he wanted. The decision ought to have been made as a married couple. Heck, he even offered to be the one on leave with the baby and repeatedly told her how much he loved her and wanted much more for them. Not surprisingly though, Cristina made an appointment to terminate her pregnancy. Do you think that Cristina will really go through with her appointment? If so, is this the end for Owen and Cristina? I can’t say that I was surprised when Owen finally chose April as the chief resident. With all that’s been going on, she was definitely a shoo-in. I’m looking forward to seeing how she will run the show. It drove me nuts when Lexie and Mark had their heartfelt talk. 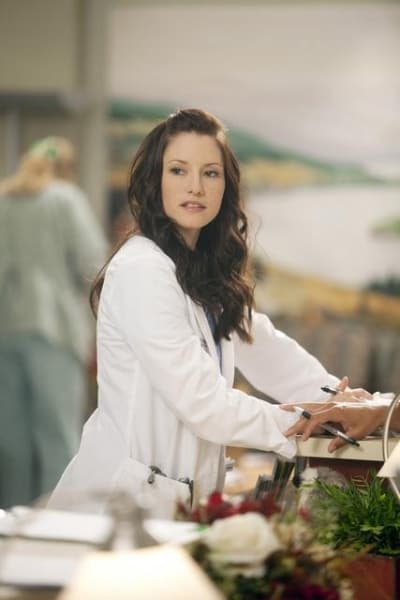 While I know that Jackson is very capable of making Lexie happy, I can’t help but to continuously root for Mark. Yes, this is whether or not he gives his blessing or simply lets Lexie walk away. Then again, if you really love something, set it free. If it comes back, it's yours. If not, it wasn't meant to be. Right?! Surely, Mark has heard of that and still believes it. And you can’t simply just forget when someone says that they’re going to always love you. While Henry finally confessed he was in love with Teddy, I was glad that she chose him over Andrew. Moreover, I was disappointed in Alex when he didn’t ask Lucy to stay. That’s Alex for you though. He’s down now, but I’m hoping he doesn’t go back to the jerk we once knew him as. He’s come such a long way now. As Bailey and Eli walked off holding hands, I wished we had seen more of them recently. I hope their relationship continues to grow next season because I certainly have missed seeing Bailey. Overall, I thought “Unaccompanied Minor” was a fitting close to a very fickle season. After weddings, babies, a musical, and more, Shonda Rhimes definitely delivered as promised with a quieter than usual season finale focusing on Meredith, Cristina and Alex. I, for one, couldn’t have asked for more. I am especially looking forward to what season eight holds for our Seattle Grace Mercy West doctors. What did you all think of "Unaccompanied Minor"? What do you expect to see in season eight of Grey's Anatomy? Sound off below!